The Style Show: Ramp up your style 2014. Ramp up your style 2014. 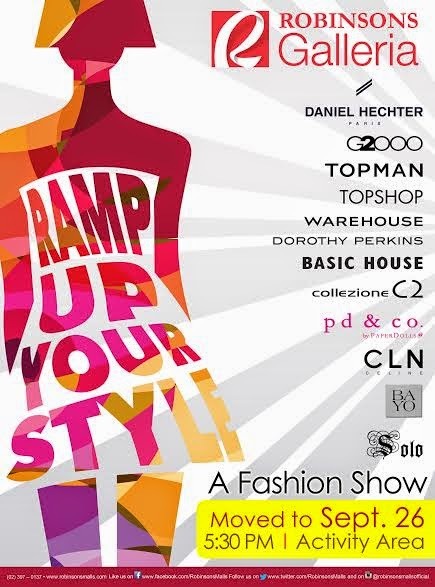 One of the most favorite shopping centers in the Philippines, Robinson’s Galleria will be having an annual fashion show entitled “Ramp up your style” this coming September 26, 2014 around 5:30 in the evening promoting their tenants’ latest products in the field of fashion. Everyone is invited to come and witness these 10 male and female models strut the runway with the mall’s in-house brands. The event will take place on the shopping mall’s activity area. The latest lookbook set of Daniel Hechter,G2000, Topman Ph, Topshop, Warehouse,Dorothy Perkins,Basic House Ph, Collezione C2, Bayo Ph,CLN ph, Solo Online and Paperdolls Ph will be featured on the show venturing from the basic, casual and all the way down to corporate. Of course, the audience will get a chance to win 1 of 10 packs of scents from KC Perfume worth P450 in a form of raffle. Some of the giveaway items will be sponsored by Pascual Laboratories (Alfa Fresh, Oracare, Potencee, Clium and Calchews). This event will be organized by Fantabulous Productions. If you want to be updated on the latest happenings and events of Robinson’s Galleria, kindly like their facebook page here. Follow them on IG (@robinsonsmallsofficial) and twitter (@robinsonsmalls). So what are you guys waiting for? Cross September 26th off on your calendar and see you there! Very nice to attend such event and good to discover other fashion dresses of the new generation. Yay! Hope to see you there bro! I wish it wont conflict on my sched! A good event to visit though..
Those are all great brands, and it's nice that they are featuring an assortment of looks. I bet that event is gonna be jam-packed. Nice event, it's worth attending but am not close. am far away. This would really be a nice fashion show to watch to check on the latest fashion items. Awesome fashion show - I am sure that would be another wonderful experience.